Tower View Annexe01263 715779work01603 870304fax Self-cateringJust a short drive from Norwich, this is a comfortable holiday home all on one level with plenty of space to relax in. 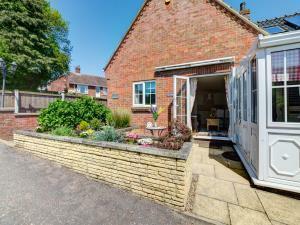 The small outside courtyard is a good spot for eating out on warmer days and there is a cosy conservatory to curl up in with a good book. A dog is also welcome meaning that the whole family can enjoy this location which is just moments from Norwich city, some pretty villages with award winning restaurants and some great walking and cycling country too. The Broads National Park and the sandy, beautiful east coast beaches are both within half an hour's drive. • Other: Towels. Travel cot, High chair. Hairdryer, Games and Books. Welcome pack. Just a short drive from Norwich, this is a comfortable holiday home all on one level with plenty of space to relax in. The small outside courtyard is a good spot for eating out on warmer days and there is a cosy conservatory to curl up in with a good book. A dog is also welcome meaning that the whole family can enjoy this location which is just moments from Norwich city, some pretty villages with award winning restaurants and some great walking and cycling country too. The Broads National Park and the sandy, beautiful east coast beaches are both within half an hour's drive.